The warm, colorful, tropical paradise that is Hawaii might be conducive to color photography, and I mostly shoot in color, but why not black and white? Especially for more street photography like scenes. In this short mini-series, the black and white wide-angle Cinematics make their return. 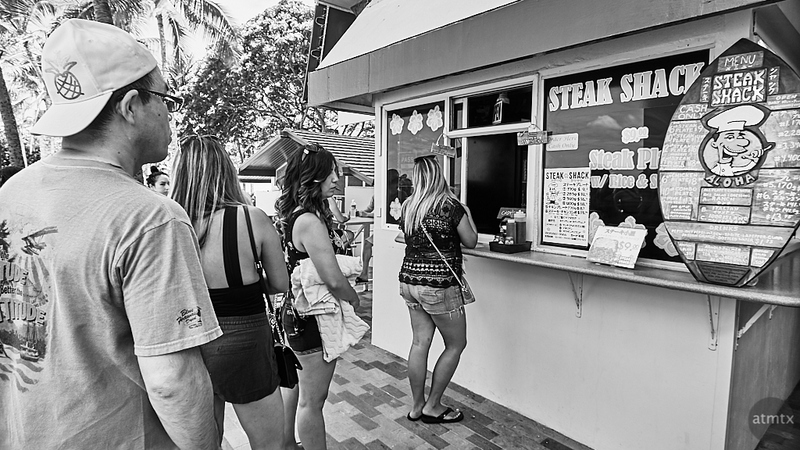 Steak Shack is one of our favorite, relatively unknown and inexpensive places to eat in Waikiki Beach. Located beachside next to Fort DeRussy Beach Park, at the modest Castle Waikiki Shore hotel. As you can tell, it is truly a shack. Popular with locals and tourists, it’s a tasty meal that rivals more expensive and fancy hotels. While nice to go to more upscale places on occasion, I’m much more of a taste over looks kind of guy. Plus, saving some money in expensive Waikiki is always a good thing. Not to mention an opportunity for photography on the street.